In silver, the total open interest FELL by 104 contracts DOWN to 190,467 with respect to FRIDAY’S TRADING. In ounces, the OI is still represented by just less THAN 1 BILLION oz i.e. .956 BILLION TO BE EXACT or 137% of annual global silver production (ex Russia & ex China). we had 156 notice(s) filed upon for 15,600 oz of gold. 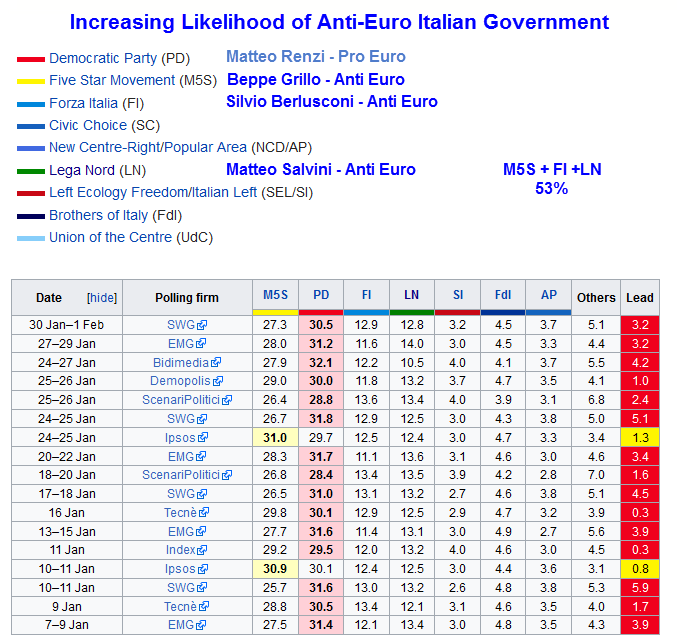 Italy most likely will be heading for early elections and if so, there is a huge chance that the euroskeptic parties will win. If so their participation in the Euro is in deep jeopardy. ii)Strange!! the LBMA is now pushing to open their vaults as the seem frightened about lack of transparency in the gold and silver markets..and they are right. The fact that we see some gold is not full proof. We need to see who the rightful owners of that gold and to see if there are a huge number of owners per oz of gold situated over there. v)Now we have 3 states wishing a gold vault. First was Texas, the second Utah and now Arizona. iv)The fun begins; The Fed has received a letter from a high ranking Republican leader in banking,Patrick McHenry claiming that the Federal reserve is ripping off Americans. We have no confirmation if the White House agrees with this..
vii)The real truth on the USA economy: it is not growing at all as the biggest companies are slashing jobs at the fastest rate since 2010. The total gold comex open interest ROSE BY 1324 CONTRACTS UP to an OI level of 401,741 WITH THE RISE IN THE PRICE OF GOLD ( $1.80 with FRIDAY’S trading). We are now in the contract month of FEBRUARY and it is one of the better delivery months of the year. In this next big active delivery month of February we had a LOSS of 194 contracts DOWN to 2192. We had 136 notices served upon yesterday and therefore we LOST 58 contracts or an additional 5800 oz will NOT stand for delivery. The next non active contract month of March saw it’s OI fall by 367 contracts DOWN to 2307.The next big active month is April and here the OI ROSE by 1412 contracts UP to 274.452. And now for the wild silver comex results. Total silver OI FELL by 104 contracts FROM 190,571 UP TO 190,467 DESPITE THE FACT THAT the price of silver ROSE IN PRICE TO THE TUNE OF 5 CENTS with respect to YESTERDAY’S trading. We are moving further from the all time record high for silver open interest set on Wednesday August 3/2016: (224,540). The active month of February saw the OI FALL by 4 contract(s) DOWN TO 163. We had 6 notices served upon yesterday so we GAINED 2 CONTRACTS or an additional 95,000 oz will stand. This is also the very first time in comex history that we witnessed in silver, the amount standing increased on each and every day succeeding first day notice in silver. The next big active delivery month is March and here the OI decrease by 2548 contracts DOWN to 123,612 contracts. For comparison purposes last year on the same date only 101,229 contracts were standing. We had 0 notice(s) filed for NIL oz for the FEBRUARY contract. Today the estimated volume was 179,960 contracts which is FAIR. Today, 0 notice(s) were issued from JPMorgan dealer account and 0 notices were issued from their client or customer account. The total of all issuance by all participants equates to 156 contract(s) of which 29 notices were stopped (received) by jPMorgan dealer and 0 notice(s) was (were) stopped/ Received) by jPMorgan customer account. To calculate the initial total number of gold ounces standing for the FEBRUARY. contract month, we take the total number of notices filed so far for the month (5005) x 100 oz or 500,500 oz, to which we add the difference between the open interest for the front month of FEBRUARY (2191 contracts) minus the number of notices served upon today (156) x 100 oz per contract equals 704,100 oz, the number of ounces standing in this active month of FEBRUARY. we lost 58 contracts or an additional 5800 oz will not stand in this active delivery month. On first day notice for FEB 2016, we had 20.124 tonnes of gold standing. At the conclusion of the month we had only 7.9876 tonnes standing. The data suggests that we had almost identical amounts standing in Feb ’16 and Feb 2017; however today’s totals already surpassed the final amt which eventually stood in 2016. (already 15.567 tonnes vs 7.9876 at the end of Feb). average 17.711 tonnes per month vs last yr 59.51 tonnes total for 14 months or 4.250 tonnes average per month (last yr). deposits into JPMorgan have now stopped. Thus the initial standings for silver for the FEBRUARY contract month: 145(notices served so far)x 5000 oz + OI for front month of FEB.( 163 ) -number of notices served upon today (0)x 5000 oz equals 1,540,000 oz of silver standing for the Feb contract month. This is huge for a non active delivery month in silver. We gained 2 contracts or an additional 10,000 oz will stand. FRIDAY’S confirmed volume was 75,150 contracts which is excellent. 1. Central Fund of Canada: traded at Negative 8.2 percent to NAV usa funds and Negative 8.5% to NAV for Cdn funds!!!! Note: Sprott silver trust back into POSITIVE territory at +0.05% /Sprott physical gold trust is back into NEGATIVE territory at -0.40%/Central fund of Canada’s is still in jail. London’s gold bullion market, which is centuries old, is said to be seeking transparency with plans to reveal how much gold bullion is held in vaults in and around London city according to gold bullion banks. These include gold bullion bars held and controlled by the Bank of England, as reported by Henry Sanderson in the Financial Times. The move is being led by the London Bullion Market Association and it is said that it will provide data for the first time on how much gold is traded in the London gold bullion market in the Square Mile. Some of the world’s biggest banks are trying to shift trading of the precious metal on to an exchange. By providing greater transparency and data, the LBMA, whose members include HSBC and JPMorgan, hopes to head off the challenge and persuade regulators that banks trading bullion should not have to face more onerous funding requirements. In London most gold is traded “over-the-counter,” or directly between buyers and sellers, so there is little data on how much changes hands. Estimates from the LBMA suggest that about $26 billion of gold is traded daily in the City but there are no official figures. 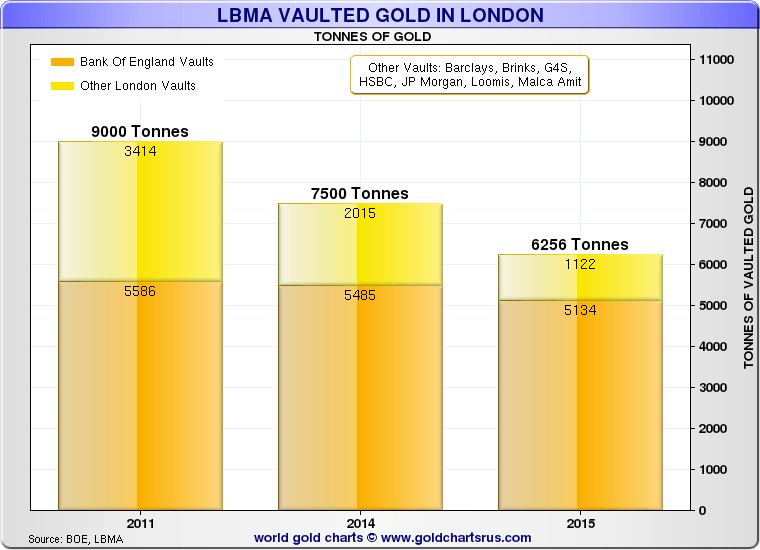 The LBMA plans to release the monthly vault data on a three-month lag, according to people involved in the process. It will show gold bars held by the Bank of England, the gold clearing banks, and those operated by the security companies such as Brink’s, which are also members of the LBMA, according to a person involved in setting up the programme. The LBMA declined to comment. London’s vaults hold billions of dollars of gold, one of the largest stashes. Vaults owned by HSBC are used to back the largest gold exchange traded fund, the SPDR Gold Shares. The vaults, in secret locations within the M25 orbital motorway, are normally equipped with extreme security measures such as blast doors and fingerprint sensors that detect the flow of blood to prevent the use of severed digits. Access is rarely granted to members of the public. An estimated 400,000 large gold bars are stored at the Bank of England’s vaults in the City, worth some $150 billion, according to the LBMA. The Bank of England holds the most gold because it acts as a custodian for the holdings of other central banks. Last year a gold vault owned by Barclays, which can house $80 billion of bullion, was bought by China’s ICBC Standard Bank. Since the financial crisis, policymakers have been pushing for financial instruments to be traded on exchanges and cleared through centralised systems. Last year the London Metal Exchange and the World Gold Council announced plans for a gold futures contract backed by a consortium of banks including Goldman Sachs and ICBC. 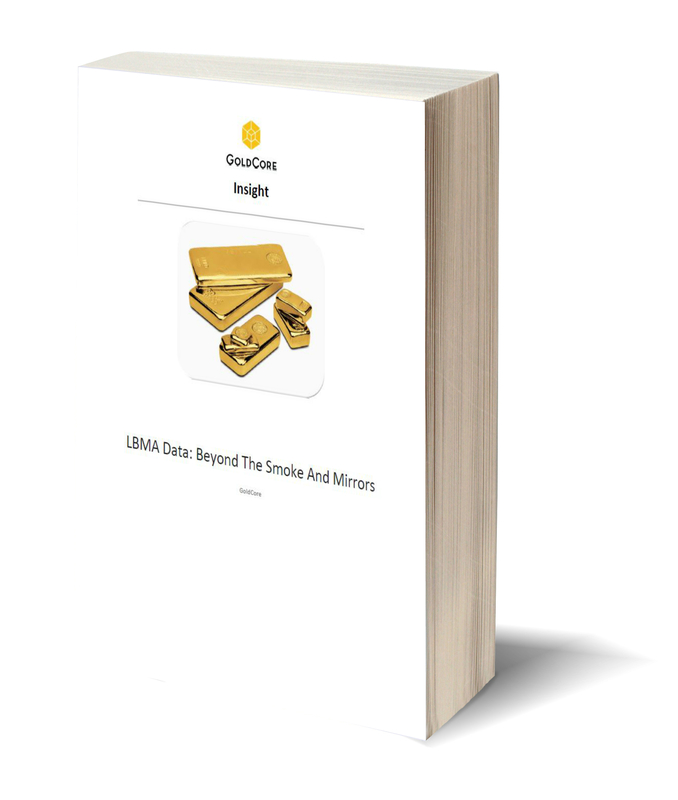 HSBC and JPMorgan, London’s biggest bullion banks, are backing the initiatives by the LBMA to improve transparency. A British law firm, Leon Kaye Solicitors, with offices in London, Portugal, and Spain, is contemplating bringing a class-action lawsuit under the United Kingdom’s Competition Act against financial institutions suspected or already accused of manipulating the gold and silver markets. The firm is seeking contact with investors who believe they may have been harmed by such manipulation. To the best of GATA’s knowledge, similar lawsuits have been brought so far only in the United States and Canada, and it would be a shame to give crooked gold and silver traders and bullion banks a pass in London, which remains the center of metals trading. It appears that people living outside the United Kingdom can become plaintiffs there. With luck discovery and deposition in all these lawsuits eventually may expose and incriminate central banks in the market rigging, as they commonly intervene in the markets through intermediary financial houses. Strange!! the LBMA is now pushing to open their vaults as the seem frightened about lack of transparency in the gold and silver markets..and they are right. The fact that we see some gold is not full proof. We need to see who the rightful owners of that gold and to see if there are a huge number of owners per oz of gold situated over there. “Open vaults”? Hardly. The LBMA will issue reports that no independent auditor will be permitted to check and confirm. Those reports will not account for gold swaps and leases with central banks and other bullion banks that allow gold to be counted multiple times. And the data will be three months old besides. These failings are obvious but, being a mere public-relations agency for the financial industry, the Financial Times can’t bring itself to question them. It’s all pathetic but this at least shows that the gold gangsters are getting nervous. London’s centuries-old gold market is to usher in an era of transparency with plans to reveal how much bullion is held in vaults in and around the city, including those controlled by the Bank of England. The move is being led by the London Bullion Market Association, which will provide data for the first time on how much gold is traded in the Square Mile. Deutsche Bank AG bought full-page ads in all major German newspapers over the weekend to apologize for “serious errors” after two years of losses that cost the lender billions of euros. Legal cases that date back many years cost the Frankfurt-based company “reputation and trust” in addition to about 5 billion euros ($5.4 billion) since John Cryan took over as chief executive officer in 2015, the ad said, blaming the “misconduct of a few” employees. Now we have 3 states wishing a gold vault. First was Texas, the second Utah and now Arizona. An Arizona bill that would eliminate state capital gains taxes on gold and silver specie, and encourage its use as currency, passed an important House committee this week. Final approval of the legislation would help undermine the Federal Reserve’s monopoly on money. I love days like today when both gold and the dollar are green. Historically, some of the best moves in gold occur as gold and the dollar move up together for short period of time. Today, of course, is just one day. And there’s no question that the Trump Government will need a significantly lower dollar in order to stimulate U.S. industry, assuming the latter is at all possible anymore. On the other hand, if somehow Trump manages to get Congress to pass his border control and excise tax proposals, consumer prices on the products being imported at prices much lower than the same products can be produced domestically will soar. Let’s not forget, gold loves inflation. In terms of the fundamentals supporting gold, the Fed’s unanimous decision to leave rates unchanged confirms my suspicion that the likely next move sometime later this year will be some sort of loosening of monetary policy. Consumer liquidity continues to dry up. This is especially evident in the retail sales reports plus the big drop reported for January auto sales. In addition, various price inflation reports are starting to emerge. On Feb 1st, Bloomberg reported that the Citigroup Inflation Surprise Index, which is a global index that measures price surprises relative to market expectations, is at its highest in more than five years. Even the Government-produced inflation reports in the U.S. have been coming in “hotter” than expected. This is a difficult feat given all of the hedonic adjustments plus other various gimmicks the Government statisticians inflict on the data in order to mute the ability of the index to measure true inflation (note: the manipulation of the CPI was implemented by the Arthur Burns-led Federal Reserve shortly after Nixon closed the gold window – they knew what was coming, which was massive money supply expansion and the resulting price inflation). In other words, even the Government will be unable to hide fully the effect that trillions of QE and credit expansion is having on consumer prices. This will act as a turbo-booster on the price of gold when this reality eventually grips the capital markets. In the physical markets, despite China’s week-long closure to observe the Chinese New Year (Year of the Rooster), the eastern hemisphere markets continue to “consume” a lot of physical gold. Premiums all week in India have been high enough to reflect moderate to heavy legal kilo bar importation. Dore bar imports have been flowing steadily for several weeks. Additionally, Vietnamese were paying $135 over world spot gold, indicating voracious demand. The latest official Swiss gold export report for December shows that the Swiss exported 154 tonnes of gold to mainland China in December. This was almost four times higher than exports to Hong Kong and more than three times the amount of gold shipped from from HK into China’s mainland. This would be the gold that enters China via Beijing and Shanghai that goes unaccounted for by the World Gold Council and the GFMS data-keepers. Additionally, East and South Asian countries accounted for 87% of Swiss gold exports in December. Thus, contrary to the popular mainstream financial fake news, China’s appetite for gold remains voracious. Needless to say, all the “stars are aligning” for what could be a spectacular year for the precious metals and mining stocks. Not the least of which is the unpredictability of, and the undefinable nature of, the Trump presidency. Most of the above commentary was an excerpt from the February 2nd Mining Stock Journal. In that issue I reviewed five previous names presented, of which three are significantly higher from when the MSJ presented the idea. Of the other two, one is down about the same amount as the sector since August and the other one is a silver exploration company that is percolating on top of what may turn out to be one of the larger silver deposits in the world in addition to containing large quantities of zinc, lead and gold. I also mentioned an emerging producer that may be acquired before summer. Latest Bill Holter interview with Sean at SGT Report. 3b Japan 10 year bond yield: RISES TO +.106%/ !!!! (Japan buying 100% of bond issuance)/Japanese yen vs usa cross now at 112.39/ THIS IS TROUBLESOME AS BANK OF JAPAN IS RUNNING OUT OF BONDS TO BUY./JAPAN 10 YR YIELD FINALLY IN THE POSITIVE/BANK OF JAPAN LOSING CONTROL OF THEIR YIELD CURVE AS THEY PURCHASE ALL BONDS TO GET TO ZERO RATE!! 30 SNB (Swiss National Bank) still intervening again in the markets driving down the SF. It is not working: USA/SF this morning 0.9941 as the Swiss Franc is still rising against most currencies. Euro vs SF is 1.0678 well above the floor set by the Swiss Finance Minister. Thomas Jordan, chief of the Swiss National Bank continues to purchase euros trying to lower value of the Swiss Franc. In a relatively quiet session, which may see US traders sleep in a bit after last night’s Superbowl thriller, European and Asian shares rose ahead of Mario Draghi’s testimony at the European Parliament, while US equity futures were fractionally higher (up 0.1% to 2,293) after stocks jumped the most in a week, as traders assessed the trajectory for interest rates while scrutinizing every new Trump tweet. As Reuters highlights, there was no overarching theme to Monday’s market moves, highlighting how correlations between financial market assets have broken down in recent months as investors sense the era of ultra-loose monetary policy may be winding up. The European STOXX 600 index rose 0.2%, led higher by basics resources shares and after some positive company results. MSCI’s broadest index of Asia-Pacific shares outside Japan rose 0.6%, with Taiwan .TWII leading the pack by adding 0.9 percent. Japan’s Nikkei rose 0.2%, with banks rising after U.S. Trump meets Japanese Prime Minister Shinzo Abe on Feb. 10 and 11, with trade and currencies likely to be on the agenda. China’s CSI 300 index rose 0.3%, though investors were cautious after the central bank unexpectedly raised short-term interest rates on Friday. Despite the modest equity upside, caution has crept through European bonds and currencies after prospective French presidential candidate Marine Le Pen unveiled a manifesto pledge to take her country out of the euro, underscoring political risk in the world’s biggest single market, prompting gold, at $1,223, to what would be the highest close since November. The National Front leader on Sunday fired at globalization and monetary integration, calling for a referendum on European Union membership and a limit on immigration. The divergence between French and German bond yields became more pronounced, with the spread at the widest since 2013. Traders are assigning greater risk premiums to European countries where anti-establishment movements are gaining traction ahead of elections. The euro was among the biggest losers among major currencies. The dollar inched up 0.1% against a basket of major currencies. Data on Friday showed average hourly earnings rose just 0.1 percent, suggesting any pick-up in inflation would be slight. This led some analysts to conclude the Fed would be in no hurry to raise interest rates. Currency investors are also awaiting details on expected pro-dollar tax and spending initiatives pledged by Trump. However, later on Friday, San Francisco Fed President John Williams said that the central bank can prepare to raise rates this year without knowing the details of any new U.S. fiscal policies. Oil prices rose, partly due to the dollar’s relative weakness, but also on concern about any extension of new U.S. sanctions imposed on major oil producer Iran over that country’s missile program. Brent crude traded near the highest since 2015 amid fresh sanctions by the U.S. on Iran after a missile test. “The move by the U.S. to impose new restrictions on Iran … does raise the risk of further tensions disrupting (oil) supply,” ANZ bank said. Haven demand sent gold toward the highest close since November. The Stoxx Europe 600 Index added 0.2 percent, after rising 0.6 percent on Friday. Miners climbed 0.9 percent, bouncing after a selloff on Friday, with Randgold Resources Ltd. gaining following quarterly results. Asian equity markets traded mostly higher with gains following last Friday’s positive close from Wall. St. where financials outperformed after US President Trump signed an executive order to review Dodd-Frank rules and NFP. This saw financials outperform in the ASX 200 (-0.1%) and Nikkei 225 (+0.3%), although the former failed to hold on to gains after disappointing Retail Sales data. Meanwhile, Hang Seng (+0.6%) and Shanghai Comp. (+0.3%) conformed to the positive tone, despite the PBoC refraining from conducting a liquidity injection, as markets digested the latest China Caixin Services and Composite PMIs which were weaker than the prior month but remained in expansion territory. 10yrs JGBs traded lower amid the positive risk tone in Japan, with an unexpected inclusion of 5yr-10yr government debt in today’s BoJ Rinban operation only providing brief support, while the curves steepened amid outperformance in the short-end. Continuing the recent tightening trend, the PBoC refrained from injecting funds via reverse repos and added that liquidity in the banking system is at a relatively elevated level. European bourses kick off the week in the green, with Euro Stoxx trading modestly higher albeit relatively flat for the session with the economic calendar somewhat light this morning, with the notable highlight due out at 1400GMT where ECB’s Draghi is speak at the European Parliament Committee. In terms of stock specific news, firm earnings has seen Rangold Resources outperform in the FTSE 100. Elsewhere, Ryanair shares slipped this morning after announcing that Q4 net profit fell 8% amid the slump in GBP. Across the fixed income space, FRA-GER 10-yr benchmark spread remains at its highest level in 3-yrs as Marine Le Pen launched her Presidential Campaign over the weekend. While previous favourite Fillon will have conduct a press conference at 4:00 PM, whereby it is largely expected that he will step down from the race after recent investigations and alleged misconduct. However, some reports indicate that he may in fact launch a counter-attack. In currencies, it has been quiet morning in FX, with the range bound theme set to extend through the week. Fed speakers are unlikely to add much fresh perspective after the US average earnings took the shine off the headline NFP rise on Friday, and with the backdrop of the lesser than expected Q4 growth stats, Trump induced uncertainty adds to the lack of differential based buying seen from the start of the year. USD/JPY continues to flounder in the mid 112.00’s, but as long as the 111.50-112.50 zone remains intact, we cannot rule out another retest on the 115.00-50 zone. In the same vein, EUR/USD sellers will be growing nervous over the lack of downside momentum ahead of 1.0700. To this end, many remain wary of another test through 1.0800 at some stage, but as we have alluded to above, this looks unlikely in the early stages of this week. The Bloomberg Dollar Spot Index rose 0.1 percent as of 10:40 a.m. in London, after earlier dropping 0.1 percent. The gauge on Friday completed a sixth weekly decline for its longest stretch of losses since August 2010. The euro dropped 0.4 percent to $1.0736, while the pound was flat. AUD, NZD and CAD all trading in tight ranges today, and will continue to do so. USD/CAD is pressed in towards 1.3000 with Oil prices ticking higher, but AUD and NZD standing pat as the RBA Tuesday and RBNZ Thursday suggest caution at these extended levels. In commodities, oil prices back in the limelight with US-Iran tensions on the rise again. The new sanctions on Iran, in response to the ballistic missile testing, do not seem to have had too radical an effect on WTI, but prices modestly higher to reflect some risk premium. Trading a little over USD54.00, WTI remains in comfortable territory, with only a move through USD55.00 likely to raise eyebrows. For base metals, the China return has failed to bring about the renewed demand —outright or from hedging requirements — with Copper back under USD2.70 again, but prices have recovered a little at thestart of the week. Nickel and Zinc gains had also stalled at recent highs last week, but look to be holding up a little better. Gold has pushed back above USD1200.00, as USD softness shows no signs of abating. USD1230.00 the next resistance level of note, but clearly USD performance dictates from here. Turning to today’s calendar, we’re kicking the week off this morning in Germany where we got December factory orders data which soared 5.2% on expectations of a 0.5% rise, above the -2.5% in November, before we got the Sentix investor confidence reading for the Euro area, which printed in line with the 17.4 expected. It’s the usual post payrolls lull in the US this afternoon with no data due out. One thing seems assured to keep us busy though and that is the various Trump related headlines which continue to dominate much of the weekend press. The latest update is the news that a federal appeals court has rejected the President’s request to reinstate the travel ban, prompting a Twitter attack from the President on the judge’s ruling. In addition to that and in a Fox News interview last night, Mr Trump suggested that a replacement bill for the Affordable Care Act could take until 2018 to come up with, a longer time frame than originally envisaged. Given the usual post-payrolls lull in US data releases this week Trump might continue to be the biggest influence in markets for now. The most interesting scheduled event this week may be on Friday when Trump is due to welcome Japan PM Abe to the White House. That meeting probably warrants even closer watching now after Trump singled out Japan and China for currency manipulation last week. So it could be interesting. Away from that it’s possible that we also get some follow up to the Dodd-Frank comments on Friday after Trump ordered a review of banking regulation and the easing of some of the Dodd-Frank act. UK politics could also come under the spotlight with the Brexit debate expected to gather some steam in the next few days as lawmakers being a three-day debate over the legislation required to trigger Article 50. Meanwhile the ongoing political saga in France never seems to be too far from the front pages at the moment. Over the weekend the National Front’s Le Pen unveiled a 144-point programme at a two-day meeting in front of her supporters. Le Pen confirmed that a National Front government would take France out of the eurozone, hold a referendum on EU membership, impose taxes on imports and limit immigration amongst a host of other measures. These comments come as one of her main rivals, Francois Fillon, continues to see his campaign suffer from revelations about his wife and family’s use of public funds in their employment. A BVA poll released on the weekend had Le Pen winning 25% of the first round voting, compared to 21% for Macron, 18% for Fillon and 16% for Hamon. A second round vote between Le Pen and Macron has the latter coming out on top by 66% to 34% and a second round vote between Fillon and Le Pen has Fillon coming out on top at 60% to 40%. The risk now perhaps for markets is the first round vote with the overall margin between Hamon, Fillon and Macron at just 5%. In reality with polling sample errors the difference is even lower and a potential risk is the possibility of a Hamon versus Le Pen second round vote. The spread between 10y Bunds and OAT’s hit 67bps on Friday and is approaching the 3-year wide of 72bps in 2014. To the latest in Asia now where markets are starting the week on the front foot and largely continuing the positive momentum from the gains on Wall Street on Friday. The Hang Seng (+0.62%), Shanghai Comp (+0.47%), CSI 300 (+0.38%) and Kospi (+0.22%) are all higher while the Nikkei and ASX are unchanged. A close eye is being kept on the JGB market too although it’s been a much calmer session compared to that on Friday. The 10y yield is currently hovering around 0.095%. There’s been some early data out in China too where the Caixin services PMI was reported as falling 0.3pts in January to 53.1. Together with the manufacturing reading last week, the composite level has dropped to 52.2 versus 53.5 in December and to the lowest level since September. Moving on. For those that missed it, much of the focus on Friday was on the release of the first US employment report of 2017. Headline payrolls printed at 227k in January which, while ahead of the consensus 180k reading, was probably closer to the whisper number following the decent ADP reading earlier in the week. The print was also the highest since September and had the effect of raising the three-month moving average to 183k from 148k. However, while the headline number was strong other elements of the report were a bit more mixed. The unemployment rate increased unexpectedly by one-tenth to 4.8% after the participation rate jumped to 62.9% from 62.7%. Meanwhile, hours worked were steady at 34.4hrs after the December reading was revised up, while the most notable miss was average hourly earnings which were reported as rising a lower than expected +0.1% mom (vs. +0.3% expected) and so having the effect of lowering the YoY rate to +2.5% from +2.8%. That softer earnings data quickly overshadowed the strong headline payrolls print and sent Treasury yields lower with the 10y touching an intraday low of 2.424% having hovered just shy of 2.500% prior to the release. However that move was then reversed later in the day following some fairly hawkish comments from San Francisco Fed President Williams. Speaking in an interview with Bloomberg TV, Williams said that all meetings, including March, are live and that three rate increases remain a reasonably guess and a reasonable perspective to have as a base case. Williams also said that “I think there’s a lot of potential that this economy is going to perhaps get more of a boost than the base case”. That comment likely helped 10y Treasury yields climb back to 2.466% by the close and finish the day more or less unchanged. The US Dollar index also chopped and changed but ultimately finished -0.06%. Meanwhile, President Trump’s comments about the potential unwinding of Dodd-Frank saw risk assets close the week on a high. The broader S&P 500 index closed +0.73% for its third best day of the year, while the financials component alone returned +1.99% and had its best day since November 14th. Unsurprisingly the big banks led the way with the likes of Morgan Stanley (+5.46%), Goldman Sachs (+4.57%), JP Morgan (+3.06%) and Citigroup (+3.18%) all leading the charge. Credit indices also had a strong finish to the week with CDX IG closing 2bps tighter by the closing bell. The employment report wasn’t the only data released on Friday. The ISM nonmanufacturing for the month of January edged down 0.1pts to 56.5 (vs. 57.0 expected) with the details revealing a 2.1pt fall in the new orders index but also a 2pt rise for the employment component. Meanwhile the services PMI was revised up to 55.6 from 55.1 at the final count which had the effect of raising the composite to 55.8 and the highest since November 2015. The other data in the US on Friday was the December factory orders numbers which rose a better than expected +1.3% mom (vs. +0.5% expected). The PMI’s were the big focus during the European session on Friday and the data made for an overall fairly positive read-through. Both the services and composite readings for the Euro area were revised up 0.1pts to 53.7 and 54.4 respectively. That reading for the composite is consistent with +0.5% qoq GDP growth which, assuming unchanged for the rest of Q1, presents some upside risks to our economists more moderate growth outlook of +0.3% qoq for both Q1 and Q2. There wasn’t a huge amount of surprise in the country level details although there was a notable fall in the services PMI in the UK (-1.7pts to 54.5; 55.8 expected). Markets in Europe also generally finished on a strong note on Friday. The Stoxx 600 finished +0.59% and so paring the weekly loss to -0.63%. Turning now to this week’s calendar. We’re kicking the week off this morning in Germany where we’ll get December factory orders data, before we get then get the Sentix investor confidence reading for the Euro area. It’s the usual post payrolls lull in the US this afternoon with no data due out. Tuesday starts in China where we’ll get the remaining Caixin services and composite PMI’s. In Europe we’ve got German industrial production and French trade data while in the US we’ll get the December trade balance, JOLTS job openings and consumer credit readings. China will also release foreign reserves data at some stage. We start Wednesday in Japan where the December trade balance is due. The only data due in Europe is the Bank of France business sentiment reading, while there is nothing of note in the US. Germany gets things going on Thursday when we’ll get the December trade data, while over in the US the data includes initial jobless claims and wholesale inventories and trade sales. Thankfully we’ve got a busier end to the week on Friday. The early focus will be on China where we’ll get the January trade data. During the European session we’ve got industrial production and wages data in France as well as industrial production and trade data in the UK. Over in the US we end the week with the import price index reading for January, monthly budget statement for January and a first estimate of the University of Michigan consumer sentiment reading. Away from the data the Fedspeak this week consists of Harker this evening, followed by Bullard and Evans on Thursday. ECB President Draghi also speaks today at European Parliament while the ECB’s Smets also speaks this week. The BoJ minutes from the January meeting are due late Tuesday night. Earnings wise we’ve got 86 S&P 500 companies reporting, representing 11% of the index market cap. Those include Coca-Cola, Walt Disney, Time Warner and General Motors. In Europe we’ve got 80 Stoxx 600 companies also reporting including Total, BP and Glaxo. Away from that, the UK Parliament’s lower house is also due to conclude on Wednesday the debate on the bill to trigger Article 50 with a final vote in the evening. The most notable Trump event this week is likely to be his meeting with Japan’s PM Abe on Friday. I still shake my head at the stupidity. One of the most overindebted countries in the history of modern finance trading with a 0% thirty year bond. Professor Malkiel – stick that in your pipe and smoke it. I am shorting JGBs with both fists. It probably won’t happen tomorrow, nor the next day. Heck it probably won’t even happen next month, but we have reached the point where I need to be short JGBs. The pressure will continue to build and when it finally bursts, the torrent will be overwhelming and quick. Although many traders think they will be able to climb on board, it will most likely be extremely difficult – like jumping on a raft bouncing down a raging river, it always seems way easier than it is. Having toyed with the key 112 support level for the past month, moments ago the Japanese currency spiked as finally the big stops at the 112 barrier were taken out, sending USDJPY sliding lower by as much as 40 pips. For now, ES is ignoring the move, although equity correlation algos have been oddly slow to react to macro moves in recent weeks. Meanwhile, the Yen jump has sent gold to $1,232, the highest price since November 16, just one week after Trump’s election. Watch if Japan’s trust banks, which do the BOJ’s bidding in times of tacit intervention, will lift the USDJPY here, or if the currency will continue sliding as global political risks continue to mount. One year ago, S&P futures would tumble the second a flashing red headline noted that things involving China, the Yuan, or the PBOC were not playing out as expected. One year later, the market has forgotten it ever cared about the world’s biggest debt bubble. However, the time may have come to once again start worrying about China. “this morning China announced an unexpected tightening of policy when it raised rates on 7, 14 and 28-day reverse repos by 10bps to 2.35%, 2.50% and 2.65% respectively. That’s the first increase in the 28-day contracts since 2015 and since 2013 for the other two tenors. Keep in mind that this is the first working day following the New Year holiday in China, so it seems to be a decent statement of intent by the PBoC. Additionally, the SLF rate was increased to 3.1 percent from 2.75 percent. The implicit tightening sent Chinese stocks lower, with the Shanghai Composite closing down 0.6%, and accelerating the selloff in Chinese 10Y government futures. While China’s first effective tightening in two years largely slipped between the market’s cracks, the press is starting to pay attention (“China’s central bank raised key interest rates in the money marketFriday, reinforcing a shift toward tightening monetary policy aimed atdeflating asset bubbles and reducing long-term financial risk.” MarketWatch, Feb 3; “China’s surprise increase in interest rates on medium-term loansweighed on bond prices. …Some traders were clearly rattled by China’s first-ever increase in interest rates for its medium-term lending facility (MLF) loans, which was seen as signaling that short-term funding costswill move higher eventually as authorities try to cool an explosive increase in debt.” Reuters, Jan 25). To be sure, Friday’s explicit tightening followed several similar implicit actions by the government, which has been flashing warnings it would tighten and/or engage in deleveraging to slow down China’s stupendous ascent toward 300% debt/GDP, including a sharp slowdown in government spending which has collapsed from 20% one year ago to only 8% Y/Y at the end of 2016, the first slowdown in home price acceleration in 19 consecutive months following Beijing eagerness to pop China’s housing bubble, the recent hike in auto sales taxes from 5% to 7.5%, and so on. China’s sudden tightening move, which according to many will end the single biggest catalyst for the global reflation/growth story of 2016, namely China’s dramatic debt-fueled growth impulse which in turn then spilled over to the rest of the world, has already been dubbed as “The Most Important Unnoticed Global Event” by the likes of Cornerstone. And since China’s push to tighten financial is really that important, here again courtesy of Goldman, is a full recap of what happened, why it matters, and a breakdown of all the key Chinese acronyms to keep an eye on in the coming days as the PBOC is very likely to continue expanding its tightening bias into other monetary conduits. On Friday, PBOC increased interest rates on OMOs (open market operations) by 10bp and on SLF (standing lending facility) by 10-35bp–shortly following the rise in interest rates on MLF (medium-term lending facility) less than two weeks ago. We believe that the PBOC will retain its tightening bias in the near term as the underlying financial-leverage and macroeconomic arguments for tightened monetary policy have largely remained. Daily OMOs have been a key PBOC tool to manage interbank liquidity conditions. The central bank on Friday increased the interest rates on reverse repo OMOs (liquidity injections) of 7/14/28-day tenors by 10bp (to 2.35%/2.50%/2.65%). The last time the PBOC raised OMO rates was more than two years ago in 2014. The PBOC also increased SLF rates on overnight/7-day/1-month tenors by 35bp/10bp/10bp (to 3.10%/3.35%/3.7%). SLF is collateralized lending by the PBOC to financial institutions which request funding (see Appendix table for key PBOC toolkit). SLF usage has been relatively small (e.g., in January, the turnover and outstanding balance of SLF were well below RMB 100bn, while those of OMOs were about 20 times larger at roughly RMB 2tn). But given that SLF is likely tapped only when the interbank funding conditions are particularly tight, the SLF rate increase should still matter for the marginal funding cost in the system. The asymmetrically large increase in the overnight SLF rate will likely be an encouragement for financial institutions to lengthen the maturity of their interbank funding (we estimate that small commercial banks’ interbank repo borrowing has an average maturity of only about 2 days). Media reports also suggest that the PBOC has increased SLF rates further by 100bp for those banks that fail Macro-prudential Assessment (MPA) requirements. This has not been confirmed by the PBOC, however. As background, the PBOC set up MPA at the beginning of 2016 through which the central bank may fine-tune each individual bank’s required reserve ratio (RRR) on a quarterly basis depending on its performance based on several prudential metrics (see here for further official details of MPA). The underlying financial-leverage and macroeconomic arguments for tightened monetary policy have largely remained. We continue to expect that the PBOC’s tightening bias will remain unless either i) there is a clearer deleveraging in the interbank funding market, and/or ii) economic activity slows materially. The president said he would not hold new elections until differences between how the lower house of parliament assigned seats. Point number 6 is in the works right now. And if such an alliance does form and win (both are highly likely in my opinion), then all that is left to stop “Italeave” is fearmongering and points 8 and 9. As Bloomberg reports,support for the SPD jumped 8 percentage points to 29% from a month earlier, the highest level since the last election in September 2013, according to the Infratest-Dimap for broadcaster ARD. Merkel’s Christian Democratic-led bloc, known informally as the Union, slid 3 points to 33%. Half of those surveyed would support Schulz if the chancellor were elected directly, compared with 34% for Merkel. The poll underscores this year’s political risks for Merkel, 62, who has previously focused on the challenge by the anti-immigration Alternative for Germany, or AfD. The unexpected candidacy by Schulz, new to German politics after leaving his post as president of the European Parliament, has opened another front while Merkel seeks a fourth term at the helm of Europe’s biggest economy in the Sept. 24 parliamentary election. As The Independent notes, the SPD appointed Schulz, a former European Parliament president, as leader last Sunday, replacing Sigmar Gabriel who said he was standing aside to boost the party’s chances. The move has re-energised the SPD, junior partner in Merkel’s ‘grand coalition’, ahead of September’s federal election. Schulz has vowed to unseat Merkel with a campaign aimed at overcoming “deep divisions” that he says have fuelled populism in Germany in recent years. As the chancellor grapples with U.S. President Donald Trump’s unpredictability, Europe’s biggest refugee crisis since World War II and a surge in support for anti-establishment forces ahead of elections in France and the Netherlands, the political headwinds at home add to a tumultuous political year in the region. Former finance minister Yanis Varoufakis strikes back and, as KeepTalkingGreece reports,urges Prime Minister Alexis Tsipras to turn his back on Greece’s lenders, adopt a parallel payment system and to unilateral restructure the loans held by the European Central Bank. In an op-ed in Efimerida ton Syntakton, , Varoufakis calls on Tsipras to prepare for break with creditors in order to avoid rupture. b. that the obedience to the 3rd bailout could be political manageable through a parallel, society-friendly program. In a striking announcement by John Bercow, the speaker of the British House of Commons, Donald Trump is to be barred from giving a historic address in Westminster Hall, the British Parliament’s grandest and most prestigious hall. Bercow announced he would not give the US President permission to speak in the 11th Century Westminster Hall when he makes a state visit. John Bercow slammed Trump for “racism and sexism”, his undermining of judges and his migrant ban. Bercow’s intervention is unusual because Speakers are expected to remain above Parliament’s partisan fray. He was cheered by lawmakers when he said that, although Britain values its relationship with the U.S., “our opposition to racism and to sexism, and our support for equality before the law and an independent judiciary, are hugely important considerations.” Trump is due to visit Britain later this year. As The Mirror reported, Bercow added that although he does not have as much say over a speech in the glittering Royal Gallery in the House of Lords, “I would not wish to issue an invitation”. It comes after 163 MPs signed an internal petition demanding Trump be refused the honour due to his migrant ban and comments on torture and women. Westminster Hall is where ex-President Barack Obama addressed both houses of Parliament in 2011 and is a venue previously used by Nelson Mandela. The Speaker added: “We value our relationship with the United States. If a state visit takes place, that is way beyond and above the pay grade of the Speaker. Bercow also outlined his opposition to Mr Trump being invited to address MPs and peers in the Royal Gallery, a room often used for state receptions. After his announcement, veteran anti-establishment Labour MP Dennis Skinner bellowed: “Two words – well done”. Labour MP Stephen Doughty, who started the ‘Early Day Motion’ signed by 163 MPs, said after the Speaker’s comments: “Our Parliament stands for liberty, equality and independence from government. We choose who we honour. Iran does appears to not be taking Trump’s escalating threats too seriously, because just one day after the US imposed restrictions on 25 Iranian individuals and entities in response to a ballistic missile test last week (a move which provoked Tehran to answer by saying it would disclose the names of US individuals and companies involved in “helping and founding” terrorist groups), Iran carried out more missile tests during a military exercise on Saturday. According to Iran’s semi-official Tasnim agency, which cited Amir Ali Hajizadeh, commander of the Islamic Revolutionary Guards Corps’ aerospace division, Iran successfully tested a range of land-to-land missiles and radar systems during the drills in a 35,000 square-kilometer stretch of desert in the northern Iranian province of Semnan. “If we see the smallest misstep from the enemies, our roaring missiles will fall on their heads,” the brigadier general was cited as telling reporters on the sidelines of the military trials, without referring to any particular nations. Any threats made by the U.S. against Iran were “nonsensical,” Tasnim cited him as saying. Hajizadeh also said tat Iran would use its missiles if its security is under threat, and added that “we are working day and night to protect Iran’s security,” head of Revolutionary Guards’ aerospace unit, Brigadier General Amir Ali Hajizadeh was quoted as saying by Tasnim news agency. Iran’s Revolutionary Guards is holding the military exercise in Semnan province on Saturday to test missile and radar systems and to “showcase the power of Iran’s revolution and to dismiss the sanctions,” according to the force’s website. Dismissing Trump’s comments that “nothing is off the table” in dealing with Tehran, the commander of Iran’s ground forces said on Saturday that the Islamic Republic has been hearing such threats since its 1979 revolution. “The defence capability and the offensive prowess of Iran’s armed forces would make America or any other enemy regretful of any incursion,” Ahmad Reza Pourdastan was quoted as saying by ISNA. Iranian state news agencies reported that home-made missile systems, radars, command and control centres, and cyber warfare systems would be tested in Saturday’s drill. Iran has one of the Middle East’s largest missile programmes and held a similar exercise in December to showcase its defence systems, including radars, anti-missile defence units, and short and medium-range missiles. Tehran confirmed on Wednesday that it had test-fired a new ballistic missile, but said the test did not breach the Islamic Republic’s nuclear agreement with world powers or a U.N. Security Council resolution endorsing the pact. Despite the heated words, Reuters reports that U.S. Defense Secretary Jim Mattis said on Saturday he was not considering raising the number of U.S. forces in the Middle East to address Iran’s “misbehavior”, but warned that the world would not ignore Iranian activities. These rather gloomy observations may explain TransCanada’s motivation to complete the Keystone XL Pipeline now. I’m talking about a long bet on oil prices. Interestingly, the gains in output in recent months have largely come from some offshore projects and gains in Alaska. That is to say, the revival in U.S. shale has barely begun to show up in the data, suggesting that future gains in output are likely, particularly with the rig count rising quickly. It won’t be long before the U.S. sees production back above 9 million barrels per day, aiming to return to its peak of 9.7 mb/d reached in April 2015. It was already unlikely that prices would rise too far above today’s levels. “I think 63, 65 (dollars a barrel for Brent) I think you might be a little bit ambitious there because the OPEC producers have got this basic issue, they don’t want the price to go too low clearly, because their economies wouldn’t stand it,” Neil Atkinson, head of the oil industry and markets division, at the IEA told CNBC. “But if the price goes too high then that’s going to attract a lot of investment in other parts of the world, principally the U.S. shale producers.” As such, Atkinson implies, OPEC wouldn’t let prices get that high. The 30 yr bond yield 3.079, DOWN 2 IN BASIS POINTS from FRIDAY night. USA dollar index early MONDAY morning: 99.96 UP 24 CENT(S) from FRIDAY’s close. The British pound at 5 pm: Great Britain Pound/USA: 1.2463 : DOWN 16 BASIS POINTS. US swap spreads (indicative of bank counterparty/liquidity risks) is surging once again, to its highest since June 2012 signaling a growing concern at the looming US debt ceiling deadline. With about five weeks until the expiration of the U.S. debt-ceiling suspension pact, Bloomberg notes, swap spreads are suggesting traders are getting nervous that any hiccup in efforts to remove the burden could trigger a shortage on short-term government securities. The difference between 2-year swap rates and Treasury yields is widening back to the 32.3 basis points level which was the most since June 2012. Societe Generale analysts led by Subadra Rajappa expect net bill issuance to drop by about $150 billion as Treasury shrinks its cash balance to $23 billion from $339 billion by the March 15 deadline. And to make things even more clear, something odd is going on in the Treasury bill market..
Bloomberg notes that investors are willing to pay more for bills maturing in four weeks instead of five. That’s because they don’t want to be caught empty handed while the Treasury slows debt sales to push its cash balance lower as part of the 2015 pact to suspend the debt ceiling. The spread between the March 9 and March 16 bills may get a “a little more noticeable” as Treasury cuts issuance and provides a “clearer sense of how long bill supply is going to be lower than normal” going into the March 15 deadline, Jefferies economist Thomas Simons said in a phone interview. Just last week, Americans were reassured (twice) that everything is awesome in the US labor market as ADP and BLS data showed jobs-jobs-jobs everywhere. However, along with wage stagnation (and a rising unemployment rate), there is a bigger problem, as Deutsche Bank warns, aside from soft earnings, hiring at America’s biggest companies is slowing down for the first time since 2010. Casting some serious doubt on just how strong the hiring environment is, Yahoo’s Myles Udland notes that Deutsche Bank illustrates that employment at big US companies is plunging for the first time since the recession. Even as optimism in small firms surges by the most on record. Expect angry Trump tweets to follow. Following a brief moment of ‘success’ for the Trump administration as a Boston judge ruled Trump’s immigration policy was not a Muslim ban, a Bush-appointed federal judge in Seattle, who said the states of Washington and Minnesota can sue claiming their residents were harmed by the ban, granted a nationwide temporary restraining order blocking Trump’s immigration ban. District Judge James Robart ruled the executive order would be stopped nationwide effective immediately: his ruling was the most comprehensive legal rebuke of Trump’s Jan. 27 executive order prohibiting immigrants from Iran, Iraq, Syria and four other nations from entering the U.S. for 90 days. Judges in Brooklyn, New York, Los Angeles and Alexandria, Virginia, had previouslyissued orders that are less sweeping. Washington Attorney General Bob Ferguson was delighted with the decision: “The Constitution prevailed today,” Ferguson said in a statement after the ruling. “It is not the loudest voice that prevails on the Constitution,” Ferguson continued speaking outside the courthouse. “We are a nation of laws, not even the president can violate the Constitution. It’s our president’s duty to honor this ruling and I’ll make sure he does,” Ferguson added hopefully. In his ruling, Robart said that “the state has met its burden in demonstrating immediate and irreparable injury” while Fergsuon added that “Judge Robart’s decision, effective immediately, effective now, puts a halt to President Trump’s unconstitutional and unlawful executive order. It puts a stop to it immediately, nationwide.” The court order, effective immediately, will remain in place until the judge considers a motion – probably within a month – to permanently invalidate the president’s order, Ferguson said. In his request for the order, according to Bloomberg, Ferguson had said the effects on the state included economic consequences for employers based there, including Microsoft Corp., Starbucks Corp. and Amazon.com Inc. Expedia Inc., based in Bellevue, Washington, had about 1,000 customers with flight reservations in or out of the U.S. from the seven countries, he said. Minnesota, like Washington, cited the effect of the ban on students at its colleges and universities, as well as health care centers including the Mayo Clinic. The state’s 5.4 million residents included 30,000 immigrants from the affected countries, it said in the lawsuit. Ferguson’s ruling was on the basis that states had already suffered harm from the travel ban. He also said the lawsuit challenging the legality of the order has a good chance of succeeding. Lawyers for the government had argued the states lacked standing to sue, according to the Seattle Times, and that the order was within Trump’s executive powers. That said, it is likely that like last Saturday’s Brooklyn decision, that this ruling oo is being blown out of proportion: to wit, a Department of Homeland Security official told NBC News that “the judge’s order will have no immediate practical effect” adding that “all previously issued visas from the seven affected countries were canceled by last week’s executive order” meaning all travelers would have to reapply. Furthermore, the Trump administration could seek a stay of the Seattle judge’s order. The decision came on a day that attorneys from four states were in courts challenging Trump’s executive order. Trump’s administration justified the action on national security grounds, but opponents labeled it an unconstitutional order targeting people based on religious beliefs – which the Boston judge has since ruled invalid. Also on Friday, Hawaii’s Doug Chin became the sixth state attorney general to sue or support lawsuits seeking to block Trump’s order. At this rate, it now appears almost certain that the Trump executive order showdown will conclude in the Supreme Court… where the tie breaking Justice will be the just appointed by Trump, Neil Gorsuch. Which is why one can see why Trump may feel confident about the outcome of the case. That may be true, although at this point an “epic court battle”, including a Supreme Court showdown now appears inevitable. This means that entry for citizens from the seven formerly banned nations are once again permitted, and thus they can resume boarding U.S.-bound flights, major airlines said on Saturday, after a Seattle judge blocked the executive order. As Reuters adds, the ruling gave hope to some Middle East travelers but left them unclear how long the new travel window might last. Trump denounced the judge on Twitter and said the decision would be quashed. “Today I face a real problem in Khartoum because the international airlines are refusing to sell me a ticket to travel for fear of contradicting the President’s decision. Now I am going from one airline company to another to convince them about the court’s decision,” she said. The State Department said on Friday that almost 60,000 visas were suspended following Trump’s order. It was not clear whether that suspension was automatically revoked or what reception travelers with such visas might get at U.S. airports, although according to today’s State Department clarification it appears that virtually all travelers who previously had an active visa will once again be allowed into the US. In an ironic twist, it appears it may not have been ‘The Russians’ that hacked America’s political system last year. As The Daily Caller reports,three brothers (Abid, Imran, and Jamal Awan) who managed office IT for members of the House Permanent Select Committee on Intelligence and other lawmakers were abruptly relieved of their duties on suspicion that they accessed congressional computer networks without permission. As Luke Rosiak repoerts, the brothers were barred from computer networks at the House of Representatives Thursday, The Daily Caller News Foundation Investigative Group has learned. Imran worked for Reps. Andre Carson, an Indiana Democrat, and Jackie Speier, a California Democrat. Carson and Speier are members of the intelligence committee. Spokesmen for Carson and Speier did not respond to TheDCNF’s requests for comments. Imran also worked for the House office of Wasserman-Schultz. While treading carefully here, and not wanting to hurt anyone’s feelings, is it just us or is the irony too perfect that having blamed ‘Russians’ for allegedly hacking their systems and manipulating the election, it was three IT staff they hired (with immigrant-sounding names – yes we said it) that in fact broke into the systems of various politicians and aides. The fun begins; The Fed has received a letter from a high ranking Republican leader in banking,Patrick McHenry claiming that the Federal reserve is ripping off Americans. We have no confirmation if the White House agrees with this..
Ralph Hamers, chief executive of Dutch bank ING, told the Financial Times that he feared the US could pull back from a global agreement on banking regulation, which has been delayed because of divisions on the Basel Committee on Banking Supervision. Mr Hamers was speaking after the emergence of a letter to Janet Yellen, the Fed chair, from Patrick McHenry, one of the top five Republicans in the House of Representatives. The letter, dated January 31, warned that the US’s “continued participation” in international forums such as Basel, the Financial Stability Board and the International Association of Insurance Supervisors would depend on meeting the Trump administration’s objectives. Mr McHenry added that such a step would probably involve “a comprehensive review of past agreements that unfairly penalised the American financial system in areas as varied as bank capital, insurance, derivatives, systemic risk and asset management”. Republicans are also pushing legislation to restrict the Fed’s freedom of manoeuvre. During the election, Donald Trump accused Ms Yellen of keeping rates low at the behest of former president Barack Obama. “This is a multi-pronged attack on the Fed’s independence,” said Diane Swonk of DS Economics. In a further marked shift of approach from the Obama administration, Mr Trump is also due on Friday take his first steps towards undoing parts of the Dodd-Frank reforms that reshaped US banking in the aftermath of the financial crisis. Mr McHenry has clout because he is vice-chairman of the House financial services committee. But whether the White House agrees with him on the issue is yet to be seen. Steven Mnuchin, Mr Trump’s designated Treasury secretary, is still awaiting confirmation by the full Senate. Wayne Abernathy, a senior official at the American Bankers Association, a lobby group, welcomed Mr McHenry’s intervention. “This whole international process is far too opaque and needs more public scrutiny and visibility,” he said. As examples of problematic Basel regulations, Mr Abernathy cited rules that penalise banks for having heavy exposure to mortgage debt collection businesses, and liquidity rules that do not recognise that Americans tend to see banks as havens in times during crises. Ms Yellen has said she plans to serve out the rest of her term, which expires in 2018. The Fed said the central bank had received the letter and planned to respond. The amicus brief emphasizes the importance of immigrants in the economy and society. The companies originally planned to file the brief later this coming week, but accelerated efforts over the weekend after other legal challenges to the order. Participating companies in the brief, filed in the U.S. Court of Appeals for the 9th Circuit, include Airbnb, eBay, Facebook, Google, Intel, Netflix, Snap and Uber. Companies beyond technology signed on as well, including Levi Strauss & Co. and yogurt maker Chobani LLC. In all, some 97 firms signed onto the brief. Following a dramatic weekend, in which a Washington judged blocked Trump’s travel ban nationwide, and the subsequent DOJ complaint was rejected by the 9th US Circuit Court of Appeals, Trump’s temporary immigration ban faces crucial legal hurdles, but the court said it would reconsider the government’s request after receiving more information. Trump’s administration has a deadline on Monday to justify the executive order temporarily barring immigrants from seven mostly Muslim countries and the entry of refugees, after a federal judge in Seattle blocked it with a temporary restraining order on Friday. “The Order represents a significant departure from the principles of fairness and predictability that have governed the immigration system of the United States for more than fifty years,” the brief stated. “The Order inflicts significant harm on American business, innovation, and growth as a result,” it added. U.S. tech firms have been among the more vocal sectors speaking out against the policy, with many of its staff made up of foreign-born nationals. In addition to the amicus bried, several large tech companies, including Microsoft Corp. and Alphabet Inc., are planning to sign an open letter to President Trump expressing concern about the immigration order and offering help fixing it and other policies. As the fallout from Trump’s exec order spread, Uber CEO Travis Kalanick stepped down from Trump’s business advisory council last week after criticism from customers and drivers. His participation in the council, along with more than a dozen other U.S. executives, prompted blow-back on social media after the controversial executive order on immigration. It snowballed into a #DeleteUber campaign that benefited rival Lyft. Meanwhile, as Trump gets mired in litigation involving his executive orders, and focusing on deregulation, there continues to be virtually no further clarity on either Trump’s economic policies or how they will be implemented, which over the weekend prompted Goldman to substantially sour on the likelihood of Trump being successful to provide a major economic boost in the near-term, and certainly not until mid-2018. Goldman also predicted that it is now virtually assured that the border adjustment tax will not make it into Trump’s tax reform, removing a major pillar of support behind the rising dollar. With the number of Californians demanding secession soaring post-election, President Trump maybe just about to give them another reason for Caliexit. While all eyes and ears were focused on his Russian comments, President Trump had some choice words for Californians during his recent interview with Fox’s Bill O’Reilly. As McClatchy reports, responding to a question from O’Reilly about efforts by Democratic state legislators to make California a de-facto “sanctuary state” that would restrict state and local law enforcement, including school police and security departments, from using their resources to aid federal authorities in immigration enforcement. Perhaps the new border wall will look more like this after all? As a reminder, a proposal for California to break away from the United States has been submitted to the Secretary of State’s Office in the state capital. If it qualifies, it could trigger a vote on whether the most populous US state should become a separate nation. As RT reports, the group behind the proposal, Yes California Independence Campaign, was cleared on Thursday by Californian Secretary of State Alex Padilla to begin the bid to collect some 600,000 voter signatures required to put the ambitious plan on the ballot, AP reported.